This weekend was an uneventful one and it was a perfect way to welcome summer. Days were spent doing a lot of nothing, running errands, hitting the beach and the pool, stopping for fresh watermelon and heirloom tomatoes. And doing a lot of reading. Little D is at the age where she is a voracious reader so you can easily find her lost in her own books for hours at a time (some of her current favorites are the Humphrey series and Wimpy Kid). And Kai, bless his little heart, thinks he can read so he will also sit quietly with his borrowed board books from the library and flip through each page, reciting the words he knows by heart, pretending to know the ones he doesn’t. I am such a passionate reader and have been from a young age (proud former president of the Beacon Hill School Battle of the Books club right here!) and it makes me so happy to see them passionate about books at such a young age. We visit the library together at least twice per week and it’s always amazing to see what they pick and how they dive right in, often before we’ve even reached the check-out desk. 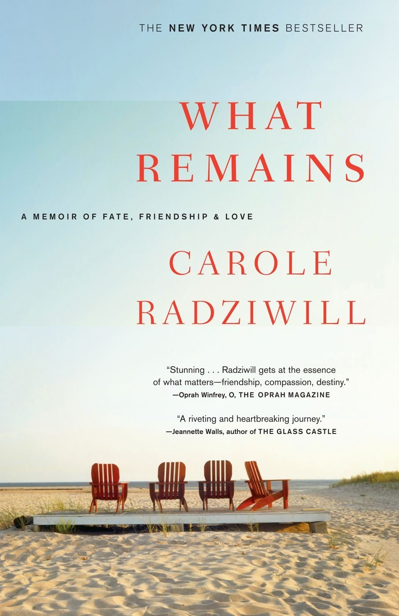 I recently read What Remains, a memoir by Carole Radziwill, upon recommendation from Laura. You may know Ms. Radziwill from her famous last name or from her role on The Real Housewives of New York City, but you should really get to know her as a writer as well. Her story of falling in love with her late husband and the years they spent battling his cancer are written in an honest, approachable voice that makes you feel like you’re her best friend. The other side of the story? Her real best friend was Carolyn Bessette Kennedy, the wife of her husband’s close cousin, John Kennedy Jr. Radziwill shares an inside look at their life as a young, newly married foursome that doesn’t feel salacious or exploitative, but honest and true. Now I am reading What Alice Forgot , which has me positively hooked. This one has been on my to-read list for a long time and I am so happy I finally got around to it. I love a light-hearted book that isn’t purely fluff and this one is just that. Will let you know how it turns out. On my equally jam-packed cookbook shelf, I’ve just added Bountiful to my collection and I am already hooked without cooking a thing. The recipes and inspiration are so lovely and simple and I look forward to a summer full of them in the months ahead. I’ve ordered Bountiful as I’ve heard SO much about it! And What Remains sounds marvelous too. I just read All the Light We Cannot See and it absolutely blew me away. Without question in my top 5 novels of all time. Spectacularly beautiful. I have to admit, I know Carol from RHONY. I’ve been intrigued by this book for a while now, and your rec just encouraged me to finally download it on kindle. Thanks! Nice, let me know what you think! It took me a minute to get into it, but once I did, I really enjoyed.